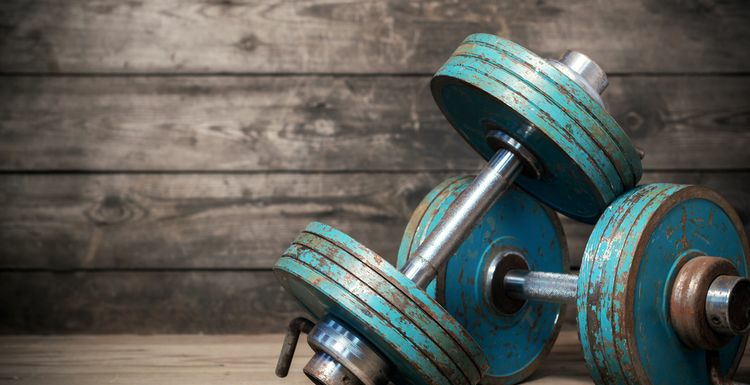 Dumbbells are the secret weapon in the arsenal of the training world. Cardiovascular exercises have their place, as they raise the heart rate and help to burn fat, but the dumbbell offers all round strength training that is invaluable if you want to build muscle and create definition. A compound lift, which is a great all-rounder for targeting your core, legs, and shoulders. Start with the weights on the floor, and hold the dumbbells in a position as you would at the beginning of a squat. Lift them quickly up to your midsection and then lift up quickly so your arms are pointing upwards and the weights pressed overhead. This exercise really targets the abs, builds your triceps and gives you a powerful core. With the dumbbells on the floor, about shoulder width apart, begin in a pushup position and hold them in your hands. Lift the right dumbbell up and bring it in close to your body. Hold it there and then return the dumbbell to the ground before repeating on the other side. Lunges allow you to isolate one leg at a time. These exercises are designed to burn fat from your lower body and are another compound lift. Hold a dumbbell in each hand, just by your waist, lunge one leg forward. Bend your trailing leg so the knee almost touches the floor and use the heel of your foot to push back into starting position. Repeat on the other leg. The chest is an area you shouldn’t neglect in your weight training. With the dumbbells bench press, you build your upper and lower pectorals, your deltoids and arms. Lie on a bench with a dumbbell in each of your hands and held almost level with your torso. Press the dumbbells together so you have straight arms, and then lower the weights back down. Repeat until you start to lose form. love dumbbells - partly because they are seen as low-tech so there's never a queue for them in the gym. easy! Dumbbell lunges are the best - they are a real cardio workout too.